About Us - Lofoten Seaweed | From Lofoten, Weed Love. Lofoten Seaweed Company was founded only two short years ago, in May 2016. It is built on the heritage of two island girls from two very different backgrounds. Angelita was born and bred in the Lofoten Islands and has the ocean in her veins. She grew up in the Fisheries working for her dad, cutting fish tongues and baiting from the age of ten. On the other side of the world in New Zealand, Tamara was also surrounded by the ocean. Her love of seaweed started from an early age thanks to her Japanese mother, who included seaweed in almost every meal. The two girls met each other in Australia when they were both studying their Masters in Physiotherapy and remained close friends for the next 10 years, despite living in different countries. After many years of visiting each other from London and Oslo, they both relocated to Lofoten- one to return home and one for love. Seaweed grows abundantly throughout the islands of Lofoten but its potential was yet to be fully realized. 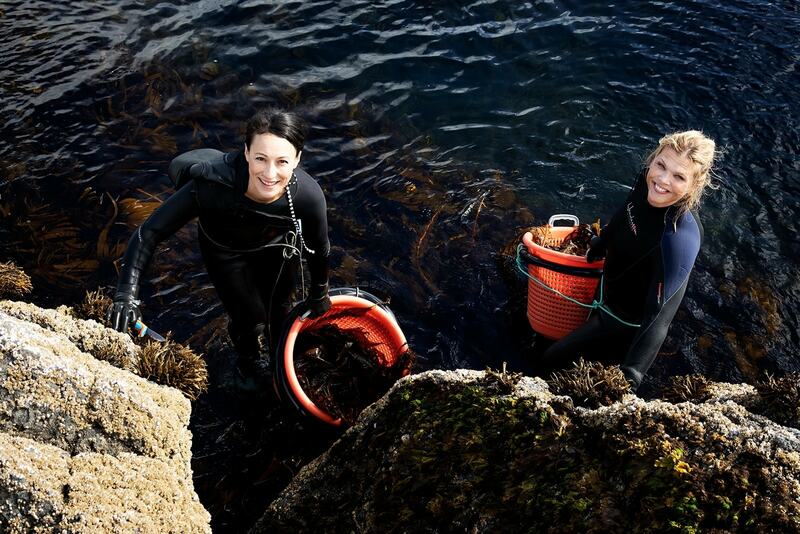 The two girls couldn’t “kelp” but be inspired by the stunning natural resources around them. 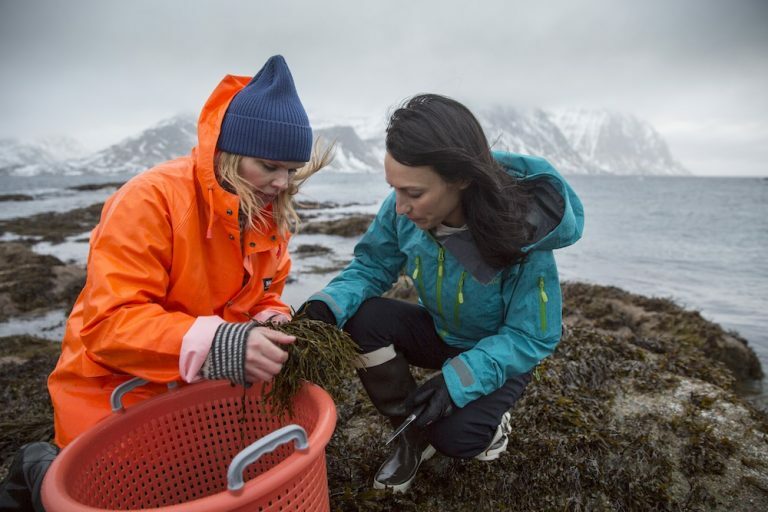 Interweaving both of their backgrounds to bring you a whole new story, the Lofoten Seaweed Company was born. The Lofoten Islands are famous for their wild, rugged nature and breathtaking scenery. Majestic mountains and white beaches surround hidden bays and rocky coastlines. The seasons are just as fascinating as the land and seascapes – you can have all four of them in a day! The midnight sun and northern lights each play their part in colouring the landscape making it (almost) supernatural. However, Lofoten’s beauty goes deeper… deep into the ocean. The Arctic waters of Lofoten are filled with treasures that rival the island’s terrestrial beauty. These ice-cold waters are home to the world’s largest cold water reef as well as the largest and best-managed cod stock in the world. They also provide an immense amount of nutrients that are the foundation for life in the sea. Last but not least, these fast-flowing waters make the perfect environment for the real superhero of the ocean: seaweed/tang. Our harvesting area is located in one of the world’s strongest local currents, known as Nappstraumen. Dancing with the warm Gulf Stream from the south, these often stormy, fast-flowing waters drive nutrients up from the deep. Cheered on by wind and tidal currents, this unique ecological phenomenon creates the versatile marine industry that the Lofoten Islands have become famous for. Under such productive and sustainable conditions, we can harvest without causing any disruption to the ecosystem, providing you with the purest and highest quality seaweed/tang. However, Lofoten’s beauty goes deeper… deep into the ocean. The Arctic waters of Lofoten are filled with treasures that rival the island’s terrestrial beauty. These ice-cold waters are home to the world’s largest cold water reef as well as the largest and best-managed cod stock in the world. They also provide an immense amount of nutrients that are the foundation for life in the sea. Last but not least, these fast-flowing waters make the perfect environment for the real superhero of the ocean: seaweed/tang.Our harvesting area is located in one of the world’s strongest local currents, known as Nappstraumen. Dancing with the warm Gulf Stream from the south, these often stormy, fast-flowing waters drive nutrients up from the deep. Cheered on by wind and tidal currents, this unique ecological phenomenon creates the versatile marine industry that the Lofoten Islands have become famous for.Under such productive and sustainable conditions, we can harvest without causing any disruption to the ecosystem, providing you with the purest and highest quality seaweed/tang. For the traditional fishing families, the ocean is like a family member. We have lived off the ocean for thousands of years and marine life has been the foundation of our existence in harsh and precarious conditions. This is especially true for the seasonal winter fishing. Every winter, the Arctic cod travel down from the far north to breed in Lofoten. This incredible migration has created a lifeline in the islands and has made the region thrive for millenniums. ingredient not just for local food, but also for many European countries such as Italy, Spain and Portugal. The climate here is excellent for drying fish and makes stockfish from Lofoten a high quality product that holds EU’s Logo of Protected Geographical Indication (PGI), just like champagne from the Champagne region in France. How cool is that? !With plentiful access to fish, the seaweed traditions became lost along the way, leaving only the local sheep to enjoy the oceanic superfood all by themselves! Back in the day, the Vikings had extensive knowledge of the nutritious and healing properties of seaweed, and søl (dulse) along with stockfish, were used as nutritious food sources on their long journeys. Dulse was also used as a beer snack – just for it’s meaty and full-flavoured taste. A real viking treat! Using both of these local food sources with a splash of Japanese cuisine as inspiration, our products get the best of two very different worlds. Every winter, the Arctic cod travel down from the far north to breed in Lofoten. This incredible migration has created a lifeline in the islands and has made the region thrive for millenniums. 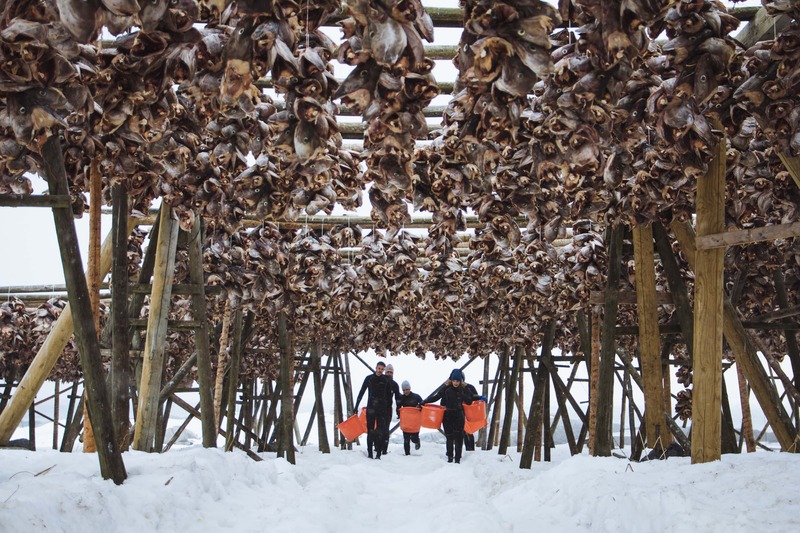 The cod is dried on racks and becomes known as stockfish, a well-known ingredient not just for local food, but also for many European countries such as Italy, Spain and Portugal. The climate here is excellent for drying fish and makes stockfish from Lofoten a high quality product that holds EU’s Logo of Protected Geographical Indication (PGI), just like champagne from the Champagne region in France. How cool is that? !With plentiful access to fish, the seaweed traditions became lost along the way, leaving only the local sheep to enjoy the oceanic superfood all by themselves! Back in the day, the Vikings had extensive knowledge of the nutritious and healing properties of seaweed, and søl (dulse) along with stockfish, were used as nutritious food sources on their long journeys. Dulse was also used as a beer snack – just for it’s meaty and full-flavoured taste. A real viking treat! 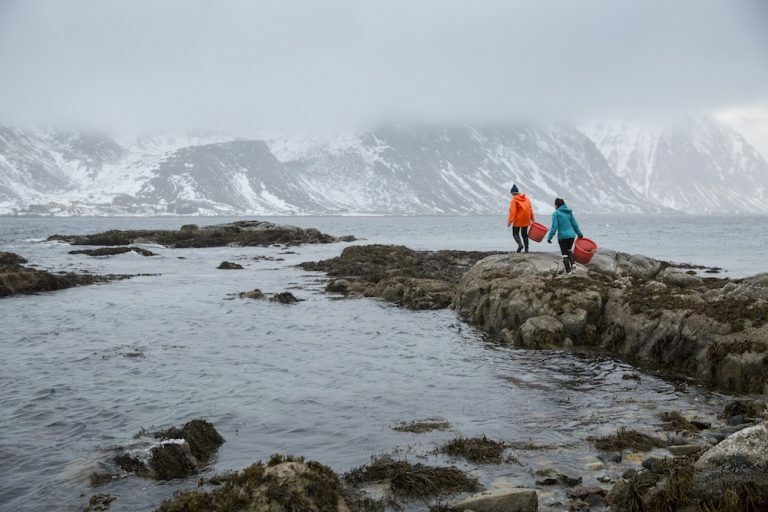 As one of the few wild-harvesting companies in Norway, we have a responsibility to protect and look after the marine environment within this unique ecosystem. We have a duty to make sure our harvesting methods are carried out with minimal impact on marine life. This means harvesting in a sustainable way, causing as little disturbance as possible to our rich marine and terrestrial wildlife. We harvest only from the cleanest waters in Lofoten. Avoiding areas with potential pollution from farms, harbours, activities or communities. We harvest by hand, ensuring adequate regrowth by cutting the algae high above its attachment to the rocks. We map out seaweed areas and harvest in a patch system for minimal impact. Different species have different growth seasons which guide our harvesting times. The areas are rotated to ensure maximum recovery. Depending on the type of seaweed harvested, some areas should be left for up to several years to allow regrowth for long-term sustainability. To ensure our supply meets your demand, we will occasionally source beautifully cultivated seaweed from other pristine waters around Norway. We also aim to have as much fun as possible and enjoy the luxury of working outside with the most spectacular views in the world. harbours, activities or communities.We harvest by hand, ensuring adequate regrowth by cutting the algae high above its attachment to the rocks. We map out seaweed areas and harvest in a patch system for minimal impact. Different species have different growth seasons which guide our harvesting times. The areas are rotated to ensure maximum recovery. Depending on the type of seaweed harvested, some areas should be left for up to several years to allow regrowth for long-term sustainability.